Phra Maha Paraminubhab Bisudh Anuttra Sangam Vijay, also known as Phra Taleng Phai, was created by Thailand�s National Artist Chakrabhand Posayakrit, initially as a set piece of the Buddha icon to preside over the Declaration of Independence scene in the puppet production of Taleng Phai, an ongoing project of a Thai traditional puppet theatre, in celebration of national heroes of the past. This scene takes place at a temple, thus requires the presence of the presiding Buddha image. 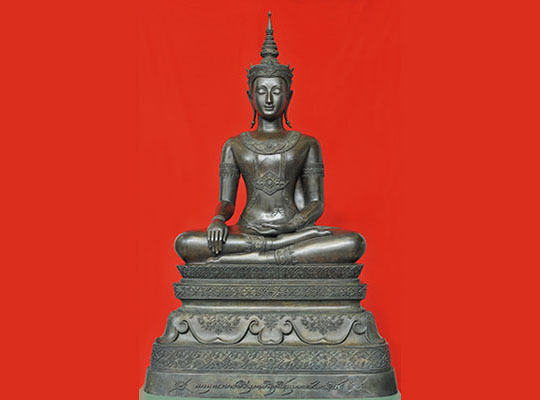 This Buddha, in the pose of Subduing Mara, was conceived as belonging to the pre-16th century period and going back as far as the Sukhothai period. The original 30-inch lap-length prototype statue is made of resin and exquisitely covered in gold leaves and adorned with Swarovsky crystals. Over the years, the 30-inch lap-length prototype has graced the Chakrabhand Posayakrit Foundation and has been worshipped by the cast and crew of the production team in the wai khru ceremonies at the beginning of every performance.